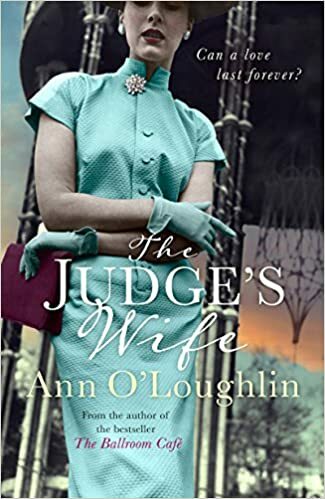 The Judge’s Wife by Ann O’Loughlin is the new novel from the author of best selling The Ballroom Cafe. Thanks to the publishers Black and White, I am offering you the chance to win both these books as well as read an extract. The Judge’s Wife is currently only £1.80 to pre-order for Kindle by clicking here It will be published as an e-book on 30th June and in paperback on 12th July. The giveaway is UK only and will be open until midnight on Thursday 30th June. The winner will be chosen at random and advised within 24 hours. Our Lady’s Asylum, Knockavanagh, Co. Wicklow, March 1954. Every part of her ached. The thin wool coat, heavy on her shoulders, scratched across her skin. The powder he had told her to pat on her face made her cheeks bristle. The shoes he had laid out for her were too high; her ankle throbbed from where she had banged it on the last stone step on the way to the car. Grace dropped her face into the soft silk of the scarf loosely knotted around her neck. Tears swelled up inside her. She wanted to roll down the window and scream, to throw herself from the car when it slowed on O’Connell Street. She scanned the crowd. A woman waiting to cross the street with a male companion took in the wide car with the soft leather seats and gave a haughty look. He had stayed with her while she dressed, his arms folded, his head bowed, waiting to chaperone her to the car. At the wheel now: a silent hulk of a man. Judge Martin Moran took the coast road to Wicklow as if on a day trip from the city. She sat beside him, tears coursing down her cheeks, chiselling grey chan- nels through her make-up. Hidden in her hand, inside her glove, was a small piece of white marble pressed to her skin, the smooth chill of the stone giving some comfort. Aunt Violet, tightly clutching her handbag, sat in the back, silent, watching her niece blubber into her scarf. The shutters were down in Knockavanagh, the shops closed for a half-day. At the far side of the town and past the meat factory, Judge Moran stopped at the gates of Our Lady’s Asylum. Panic streaked through Grace. Tentatively she put a hand out to her husband, but he jerked away. They slid past the tall grey building with the small windows and the water tower set aside on marshy land. At a small stone bungalow, the Morris Oxford pulled into a parking space marked “reserved”. “This is your new home. For a while, anyway.” The judge spoke in a firm and matter-of-fact tone. Aunt Violet placed a tight grip on Grace’s shoulder. A man in a suit flanked by two attendants emerged from the house, smiling, arms extended. Grace was gently helped out, her small leather case taken from the back seat. Her words fell into the pit of the space between them as Martin was shown into the small house. Aunt Violet waved her gloved hand in the air. “Coffee is an excellent idea,” she said. Catching her up under the arms, they scooped her so high her shoes fell off. Grace stepped in. Pressing her back into the wall, she held her arms tight across her chest. Her gloves were wrenched off. Her silk scarf slid to the ground. Her coat was yanked from her shoulders and her dress pulled so that the flimsy satin gave way down one side, the sound of the tearing fabric shrieking through the room, echoing the screams in her head. She stood in her cream silk underwear, shivering. The attendant took a step towards Grace. Quickly, she danced out of her slip, unhooking her bra, desperately trying to hide her breasts. Grace pulled down her knickers, shame flushing through her. She stood, her legs squeezed together, trying to hold in a pee. Voices, loud and jovial, wafted past: the hurried goodbyes, the crunch of gravel, the purr of the Morris Oxford as the judge turned it in the small yard and drove away. With a push to the back, Grace was guided across the corridor to a long, narrow room with five tiled showers. A bar of red carbolic soap was shoved into her hand; the cold tap was turned on. Grace slapped the soap across her body, the harsh smell making her want to throw up. When the water stopped flowing, she was handed a towel and a blue flannelette nightgown. Rough to the touch, the nightdress had been boiled so many times that the flower pattern had long since faded. They marched her down a long corridor. As they approached the steel door at the end, a key screeched in a lock. The door was pulled back from the inside. Grace was directed to where a stout nurse was waiting for her. Scuffles of clouds framed by rectangular, dirt-encrusted windows danced overhead. The sound of laughter drifted up from downstairs, where the two attendants puffed on cigarettes and relayed to the staff canteen every detail of the committal of the judge’s wife to the asylum. Spanning three decades, this is the moving story of three women and how one great love changed their lives forever. With her whole life ahead of her, beautiful young Grace’s world changes forever when she’s married off to a much older judge. Soon, feeling lonely and neglected, Grace meets and falls in love with an Indian doctor, Vikram. He’s charming, thoughtful and kind, everything her husband is not. But this is the 1950s and when she becomes pregnant, the potential scandal must be harshly dealt with to avoid ruin. As soon as she has given birth, Grace is sent to an asylum by the judge and a conniving aunt. Vikram is told that Grace died in childbirth and returns, heartbroken, to India. But it’s not the end of the story. Thirty years later, with the judge dead, his estranged daughter Emma returns home, full of anger and resentment. There she finds Grace’s diaries and begins to uncover a mystery about her mother that she had never suspected. Meanwhile, in India, Vikram is planning a long-awaited trip to Ireland with his much-loved niece, Rosa, who has heard all about Grace and her uncle’s long lost love, so that he can stand, at last, at the grave of the woman he loved. As secrets are finally uncovered, will they be able to cope with the biggest secret of all? This was on the wishlist as soon as I saw it. Thank you for a lovely giveaway. Sounds like a deeply moving book. Wow, the storyline sounds really good. I can’t wait to read it. I really do like the sound of this unconventional love story with many secrets, Thanks for sharing as I hadn’t come across either of these titles before.